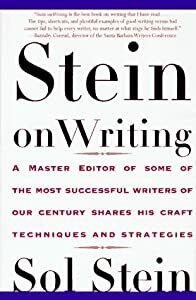 Just completed a good book about writing by Sol Stein – Stein on Writing. Sol Stein not only has written books, he has edited numerous bestselling and critically acclaimed writers. If you want to be a writer, or are a writer, if I were you I would pay attention. Excellence in diction is the most important characteristic of fine writing. He means that the right word choice makes all the difference in a good book. Do adverb and adjective liposuction on your manuscript. Most sentences don’t need more words to make them better, they need less. Pick up the pace of your manuscript by making conversation adversarial, short sentences, frequent paragraphing, eliminate two-thirds of your words, delete scenes that don’t matter to the whole project even if they are lovely. Use all six senses throughout your story. Wow! Does this make a difference! Flashbacks: as a rule never put them in the first few chapters, and cut down on information dumping. Similes and metaphors? Use them. No clichés allowed. Revision is the most important part of writing. Mr. Stein says a great deal more in his book. His examples and his chapters on how to write specific things like love scenes should not be ignored, but I don’t have room or time for more. I hope this helps give you a little boost in your writing today.